This rare box is in remarkable condition and still contains its precious relics, most likely because it was preserved inside a stupa. 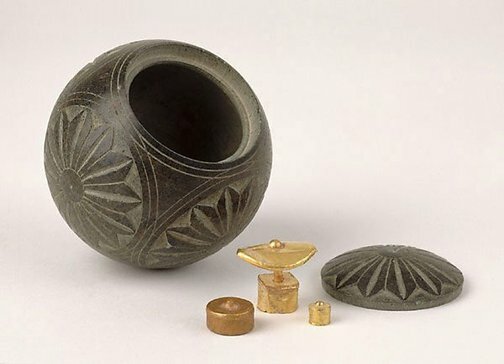 The contents are essentially intact and comprise the gold finial of a stupa (consisting of a square entablature, or 'harmika', and parasol), a small round gold box filled with tiny beads and rock dust, and a larger round copper box, the contents of which have been removed. The Asian Collections, AGNSW, 2003, pg.28. The Asian Collections Art Gallery of New South Wales , 'Buddhist Art', Sydney, 2003, 28 (colour illus. ).